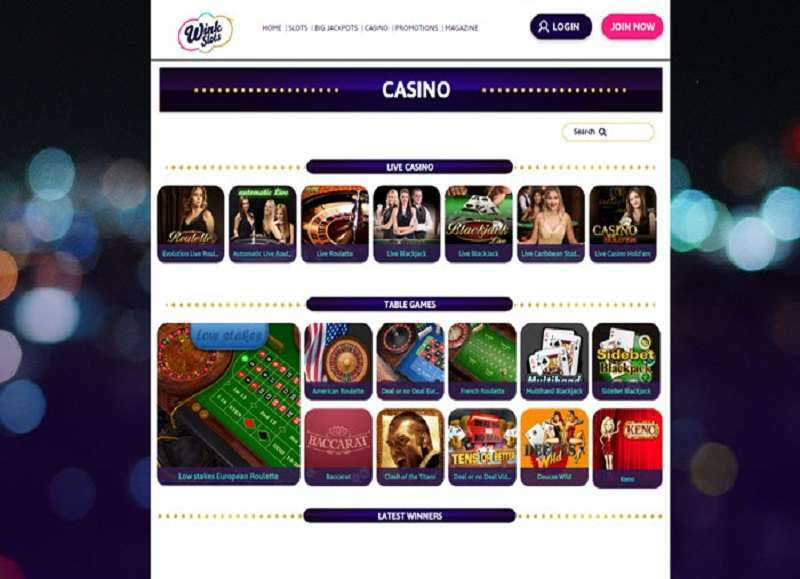 Wink Slots online casino is one of the several online gambling sites owned by 888 Group, which is a subsidiary of Cassava Enterprises Limited. It started operating in 2016. 888 Group, legally known as 888 Holdings PLC, is a publicly traded stock in the London Stock Exchange. Cassava was incorporated and licenced in Gibraltar, which is a part of the European Union. Wink Slots received its licence to operate from the Gibraltar Gambling Commission. All of the company’s casinos that operate in the UK are licenced and regulated by the UK Gambling Commissions. A licence from the UKGC is mandatory if you operate in the UK, either physically or online. Unlike the Gibraltar Gambling Commission, the UKGC does not facilitate the arbitration of customer complaints. 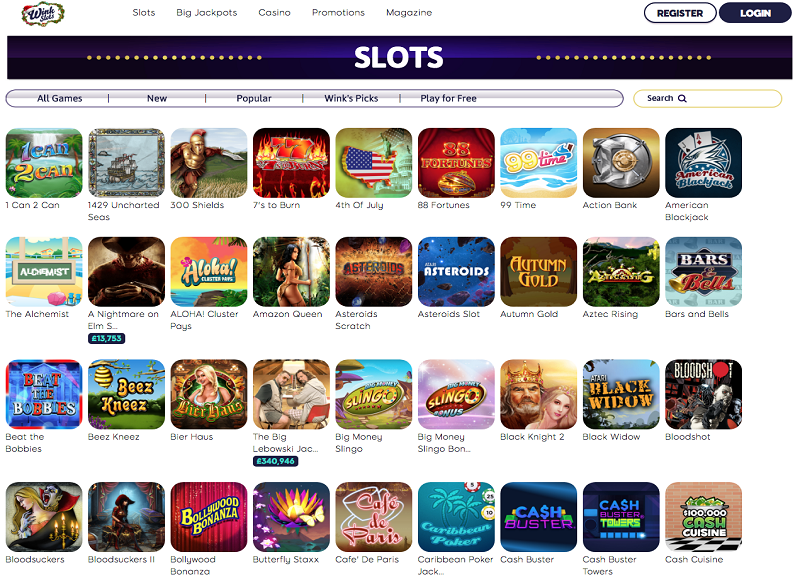 There are eight promotions available to regular and new customers of Wink Slots casino. Read below to find out more. The first game for new players is free. After your first deposit, you will get a daily free game plus one free scratch game. Winnings are capped at £100 and subject to 30X wagering requirement before withdrawal. Applies to Spin the Wheel. You will get as much as 500 free spins on your first deposit. Winning payout is capped at £400. The wagering requirement is 30X of the bonus amount. Players can get up to 10 free spins for every £75 real money wagered on specific games. These games are from the fruit category: Freaky Fruit, Fruit Abduction, Fruit Shop, Fruit Basket, Frootylicious, Fruit Blast, Froots. The 10 free spins can only be played in 99 Time. Must be claimed within 7 days or it will expire. Valid for 7 days after claiming. The bonus is capped at £4. Bonus wins capped at £400. Maximum of 30 free spins per day. Available to funded players only. Players can get free spins and cash bonuses. To participate, you need to go to your casino inbox and select My Wink. Select Daily Challenge and complete what is required. Players can use the code MONDAY as much as they want only on Mondays. Wink Slots bonus is subject to specific T&C. Each promotion has a different set of terms and conditions, which the players can read on the website. The site has three main lobbies. The casino lives true to its name. There are more slots here than table games. 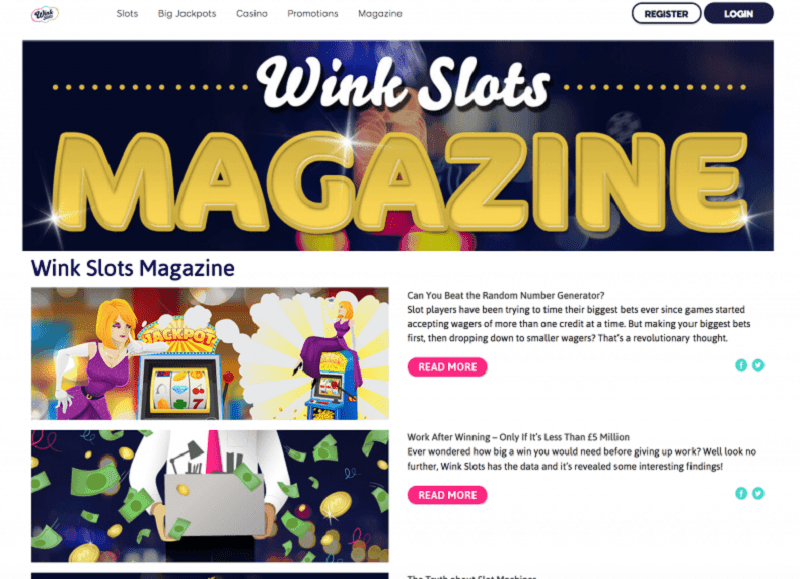 In this Wink Slots review, we will take you to the three lobbies and elaborate what games are playable on each. Slots. There are 365 games available in this lobby. Players can filter games by choosing New Games, All Games, Popular, Wink’s Picks, Instant, Play for Free, and Fruit Spins. You can also type the game title in the search box provided. Popular titles found here are Aloha! Cluster Pays, 99 Time, Dead or Alive, Guns N’ Roses, and Jackpot 6000. Big Jackpots. These are slots games ordered based on potential jackpot winning from highest to lowest. As of the time of this writing, there are 29 items here. The highest jackpot listed is £316,000. Casino. In this lobby, you will find a wide selection of table games, including live dealers. The lobby has 20 live casino games and players can choose between, roulette, dream catcher, casino holdém, blackjack, and 3 Card Poker. There are 13 table games here (not live) and these games include roulette, blackjack, baccarat, and keno. No download is required to play the games. The casino was designed for instant play. It works on modern browsers on both PCs and phones. However, these phones must be equipped with average processors and memories. In addition, the phones must have the latest versions of browsers like Mozilla Firefox, Google Chrome, Safari, and Microsoft Edge. For the purposes of efficiency and optimisation, the casino created a mobile app but it is only available in the iOS platform. The casino has multiple deposit and withdrawal options, but not as extensive as other casinos. See below for the complete list. number +44 (0) 800 018 3307. Visa and Mastercard. This is the quickest deposit method and all currencies are accepted. However, they will be converted to GBP once transferred to your casino account. Neteller. All currencies supported by Neteller can be used to deposit funds. However, this funding and withdrawal option is only available to UK players. VISA Debit Cards. It works like a credit card, and it can be used to deposit and withdraw. But it is subject to specific rules laid out in the terms and conditions. Paysafecard. This is a prepaid voucher that you need to buy from hundreds of physical outlets. You can use the voucher to fund your casino account but you cannot use it to withdraw. PayPal. The world’s leading online payment processor. All currencies supported by PayPal can be used to deposit and withdraw funds. EntroPay. This is a reloadable card powered by VISA. You can use it to make purchases like any VISA-powered debit card. ApplePay. This is only available to UK players. All currencies are accepted. You can only use this method through Apple devices like the iPhone, Mac, iPad, and Apple Watch. Here some pointers to remember about the deposit and withdrawal policies. Wire Transfer deposit for real money can take between five and eight days to complete. Minimum deposit amount is £10. Players have the option to increase or decrease their daily deposit limits. Withdrawal requests can only be reversed within two days from the date of the request. The default withdrawal method is through the deposit funding option. Note that these withdrawal options can only be used for your withdrawal balance if you used them at least once to deposit in the past four months. The maximum withdrawable amount is £1,000 per day, £2,000 per week and £3,000 per month. Consult the table below for the withdrawal timeframes. The website does not make it easy to find customer support. Nowhere on the home page will you find a Contact Us link. But you will find support details once you go to the FAQ Section. There are only two customer support channels: email and phone. Email support will take 72 hours before you get a response. You can send an email through the website portal or to help@IGSupportTeam.com. The company’s toll-free phone number is 0800 018 3307. However, this is only available for UK customers. All other callers will be charged applicable to international dialling fees. Phone support is available from 9 AM to 1 AM UK time, seven days a week. Currently, the casino only accepts EUR, USD, and GBP. The main currency used in all transactions is GBP. The only language supported is English. The casino is powered by three developers: Dragonfish, Evolution Gaming, and Net Entertainment. This company is part of the 888 Group. It focuses on mobile first technology and services all casinos operated by Cassava. Apart from creating casino games, the company also offers marketing and operations services. Examples of these are back-office tools, CRM integration, multi-lingual customer support, and IT communications infrastructure. Popularly known in the industry as NetEnt, it has a global presence and operates on almost all casino portals. It is one of the best software providers that created games like Jumanji and Gonzo’s Quest. Wink Slots is great for slot machine lovers. It has a massive list of slot games that players from different niche specialisations can enjoy. The site is competitive in terms of promotions. The players will love the fact that the terms and conditions are well laid out. The policies and wagering requirements are transparent enough that players will not feel they were lured into a trap. An area of opportunity for the casino is customer support, which does not operate 24 hours. There is also a lack of provision for live chat, which many players around the world prefer over email and phone. It will also do the company well if it can add more software providers because it only has three. More and more developers are introducing new and exciting games every week, and the casino may miss out on the next blockbuster game if it does not start working with other developers.